My hair is finally going back to “nearly” normal. My normal red hair was all white when it started to grow back. 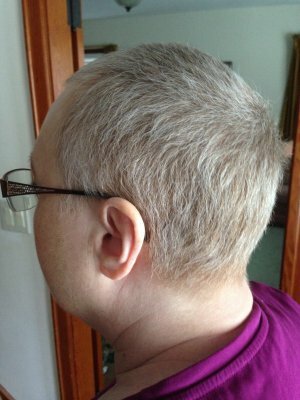 Now that it is 14 months since I had my last chemo, and my hair has thickened up a lot, most of the white has disappeared. And now my hair is is going from brown to red again! My hair at the roots is turning red, even though the ends of some of the hairs are still white. It is such an odd thing to see. Normally it would be the other way around where a person turns white at the roots, and the colour grows out and is cut off. But for me the white is disappearing as the colour grows back. And some of the red hairs are a deep red that I haven’t had since I was in my thirties. 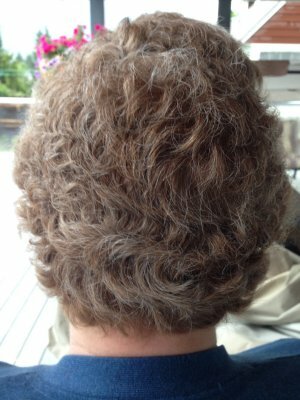 Also, the chemo curl that I had is mostly gone. At the very back of my head I still have remnants of the wavy hair that has a mind of its own. 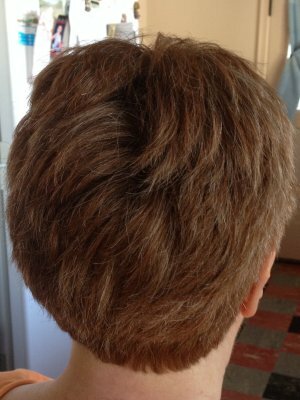 The hair on the top has a bit of wave left, but no real curl, and there are areas that have gone completely straight. It will be interesting for me to see if all of the wave is gone in a year or so. It was nice to have some “natural” curl for a time. I did like that I didn’t need to curl my hair. But I also know why some people complain about their curly hair. While curl is nice, it can have a stubborn mind of its own that is hard to control. 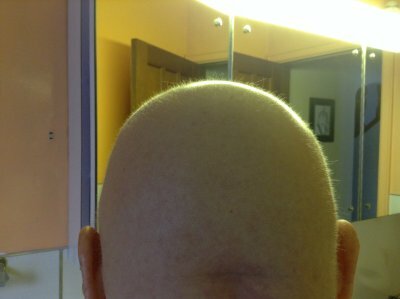 My chemo-curl came with its own cow-lick, and that is mostly gone too. I am posting pictures from the first growth through the different stages of curl and colour. The first picture is the baby white fuzz. The second picture you can see that the new growth is mostly white. What a shock! Or maybe I should say that I turned blond? 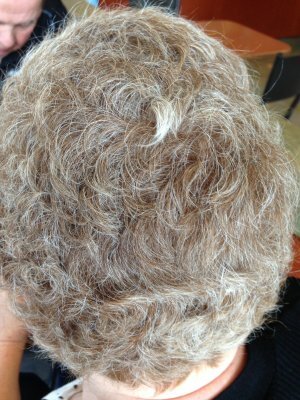 The third picture is the chemo-curl and still mostly white hair. In the fourth picture, you can see that colour is starting to come back, although the colour was mostly brown and white. The last picture is where I am at right now. My red is back! I have always been a passionate person. I don’t know how to live without passion. And because I am so passionate, I can be a real hermit and a work-a-holic. But I am learning that there is a time for everything. There is a time to drop everything and be with friends. Friends are God’s gift to keep me “normal”. During this time of my illness, God has allowed me to have such special friends who have been there for me in faithfulness and kindness. They even cared for me just the way I am. Even when I was bald and had no eyelashes, I was still a person to them and had no less value! I LOVE that! I am also learning to take time off. That doesn’t apply to the last several weeks when I have not had time to breath because I was on a deadline. Other than that I have learned that there is value in just doing nothing and taking time off to refresh the soul. As March is now upon us, I plan to have breakfast on our sun deck as much as the weather will allow. Breakfast can last as long as I want because smelling the fresh spring air is good for me. The sun is warm on that side of the house, even though, the temperatures can still be on the cool side. But it is going to be warm enough for breakfast on the deck very soon. I am working on a huge DVD project that will include multiple DVDs in a series. This has taken me so deeply into the Word of God and has grown my faith even stronger. I have learned more about the character of God through this project than I expected. I have come to love Him even more dearly by seeing and understanding why He does the things He does and why He requires things from us. For example, I have learned that we must love our enemies for a reason. Why? Because God loves His enemies, and He loved them even to the point of dying for them. He desires that we grow to be in His image and be like Him. For us to be more like Him, we need to learn to be a reflection of His character even in tough situations and even with tough and challenging people. Is it easy for us to say nothing when we are maligned and slandered? No, it really isn’t, but I am learning that quiet trust in God will always trust that He is working to make things right on all sides, not just my side. He does this because He truly loves all people, even those who do not deserve God’s patience and love. I am drawn closer to the heart of God when I reflect on how much God loves those who have treated me unfairly. I am learning to focus on God’s love for them first because God’s love focuses on repentance and reconciliation first. He encourages us to pray for the people who have wronged us and pray for their repentance and reconciliation with God in their lives. When we do that we will have the opportunity to practice grace and mercy in the midst of harsh, prejudicial treatment. It is in this sometimes deep valley where we see the beauty of our Savior’s face. He did not strike back when He was abused and whipped. He willingly took our punishment that we deserved. In gratefulness for all that He has done, is it too much to give back to Him by loving those who despitefully use us and abuse us by praying for them? A verse that has become very precious to me these past six months is Micah 6:8. I love how both the New King James and the New American Standard render this verse. I love that God has both “shown” and “told” us and I love that we are to love “mercy” and “kindness”. SO precious! Micah 6:8 (NASB) He has told you, O man, what is good; And what does the LORD require of you But to do justice, to love kindness, And to walk humbly with your God? So happy for you Cheryl. What a beautiful and inspiring post. Thank you Jenny. This post is what is in my heart. Difficult times, but precious growth in the midst of the valley. Cheryl, what a journey you’ve been on. Thanks for sharing your walk with us – it’s been encouraging and challenging. And I love your red hair! Thank you Carol! It is so good to feel normal again and not 80 years old. I always hated my red hair when I was a kid. I didn’t think I would ever miss it. It teaches me to be thankful for what I have. I am thankful to have hair, and seriously glad it is red again. Aw…thank you Marilyn! And thank you for the advise on lavender oil as well. Cheryl you are an amazing example of courage and strength in the midst of difficult times. Thanks for sharing your life with us. You are not only an inspiration but a dear friend. We hope that you and Richard will make it out here to visit sometime. We will always have a place for you in our home and in our hearts. Thank you Karen for your kindness to us! We hope to make it back to Edmonton at some point. We would love to spend some time with our dear friends there. I pray that God keeps you in health for many more years. DIane, thank you for rejoicing with us. Friends who stand with us during our good times and the bad are so precious! How are you Cheryl? You’ve been on my mind so much. Hi Cindy, I am doing very well. Just SO busy on a new DVD project. It has been on my mind to do another update here on my blog. I should do it soon. I just have to carve out some time to get it done. Thank you for caring! I ope you are doing well. I just looked at your discussion with Matt Slik. I haven’t seen a discussion that has refuted him before… Is there anytime soon that you are thinking of going back to your Women in Ministry blog and updating it? I see that you said u were working on a video in 2013. I am doing very well. Thank you! I have a post almost completed to put up for this blog. Hopefully, I will finish it this week. I also have some technical material that I will be posting on my women’s blog. When? I don’t know. It is really hard for me to balance all the balls that I have up in the air. I am working on the video editing of our newest DVD. Production came to a halt when I got cancer and so did pretty much everything else. Then last fall my husband found out that he had cancer. He finished his treatments a little less than two weeks ago. It is a blessing that his cancer is slow growing and he is feeling well. I would really like to get the video production finished this year. We also have a new online store that I am working on. And my blogs. So as far as working on the WIM blog, other than the technical article I need to get up, I am open to questions, but otherwise I don’t have as much incentive to put in the time on a subject I have already spent so much time on for years while I am busy with other things. By the way, my blog has moved to https://mmoutreach.org/wim as all of my blogs have moved under the main website of mmoutreach.org. The new location will be where I post any new articles and/or answers to questions.